We needed a boy around here, didn’t we? This fall when the evenings start to cool down, Oliver and his friend, S, will both be sporting easy-to-sew, kimono-inspired pajamas. 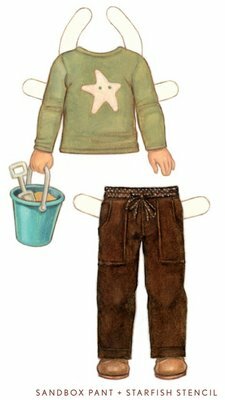 During the day, Oliver and S can both wear their favorite Sandbox Pants to the playground, along with freezer-paper-template starfish painted on their t-shirts. … has a few daytime options of her own. 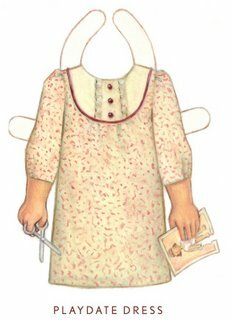 For playing paper dolls with friends, she might wear her Playdate dress. 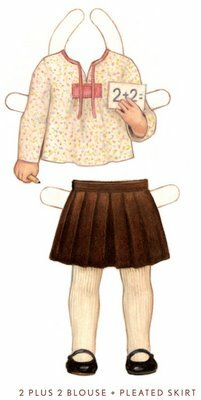 If she’s headed off to school, perhaps it’s the 2 Plus 2 pleated skirt with gathered-front tunic blouse. On weekends, her Sunday Brunch jacket and skirt look great at the neighborhood creperie, where she goes with her parents (with Nutella crepes for dessert!). No matter what the occasion, we think they’ll both be suitably dressed. All patterns will be available in August, with an expanded size range from 6 months through 8 years. And for the next two weeks, all website orders for Spring collection patterns will include a fall preview paper doll set, featuring both Oliver + S and their new fall outfits. Enjoy! It all looks divine Liesl. I love the whimsical names you give each of your garments. They alone make me want to try all your patterns. I *love* the jacket and skirt. Too precious! I love these! I think I want to buy each one. These are fantastic! August can’t arrive quickly enough!!! I’m excited to hear more about the boutique sewing program as well. These are great. I can’t wait to try the patterns out! I can’t wait – I am still buying the Spring patterns! I’m not even a sewer, but these have inspired me. Thankfully I have a 4 month old daughter so I have a bit of time to perfect the dresses for when she is 2!! Oh man, I’m in love. So glad you’ve included bigger sizes and boys stuff. Can’t wait to get sewing! I am very excited that you have included larger sizes. 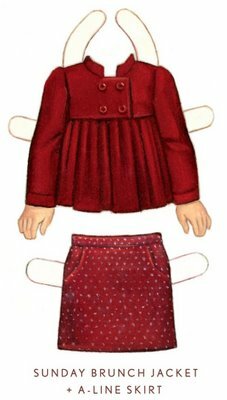 Are these larger sizes going to be available the patterns you are already selling (like the Swingset and Puppet Show tunic patterns)? It’s all so fabulous! I love them all! holy cannoli! I can’t wait for the boy patterns!! yippie, finally something cute for boys! Such beautiful, classic designs. I can’t wait to get my hands on them! the fall line-up looks amazing. so happy to have boys wear, love the cargos! and the playdate dress, it’s my favorite! This are just stunning, really!! I had to get up and walk away from my computer, I was so excited to see the boys things and new stuff for girls! And if they are available in August it will give me plenty of time to have some ‘back to school’ pieces for both children!! Can’t wait! That jacket and skirt are sublime, and I’ve been waiting for just the right pajama pattern. Yay! I have been waiting for 5 years to have patterns this delicious and beautiful to sew for my precious Liv. I am so excited! You rock! i washed the fabric so that’s the first step…. liesl, i am soooo excited that you are going up to size 8! my girls both wear a 7 now and i adore your designs. lucky me! YES!!! i am incredibly thrilled at the extended sizes!!! my daughter is 6 and i keep looking and longing for her sizes! YAY! thank you so much!! she only wears dresses and skirts and will love these girly styles for fall! I just finished the puppet show tunic. Your directions are great. Can’t wait for the boy stuff. I just found this. They are SO cute! This looks like it will be a great collection coming up. Oh they all look so beautiful. I can’t wait!